A Netflix original movie by Bong Joon-ho. This is Okja. This American-South Korean action-adventure film directed by Bong, and co-written by Bong and Jon Ronson. A young girl who risks everything to prevent a powerful, multi-national company from kidnapping her best friend - a massive animal named Okja. In October 2015, it was announced that director Bong Joon-ho's next film will feature a South Korean female lead and a cast of English-speaking supporting actors, with filming set in New York. In November 2015 it was picked up by Netflix and Plan B Entertainment with a budget of $50 million, with production starting in late 2016 for release in 2017. Bong sought out Welsh author Jon Ronson to rewrite the script. Working with a rough draft of the story, Ronson helped develop the English-speaking characters. Principal photography began in April 2016, locations included Seoul, South Korea, and Vancouver, British Columbia, Canada. Director Bong Joon-ho has called Okja "a very shy and introverted animal. It's a unique animal that we've not seen before." This is very clear from a single watch of the film, wherein we are shown repeatedly that Okja's level of intelligence is far above that of any cat or dog, despite her large size and original appearance. 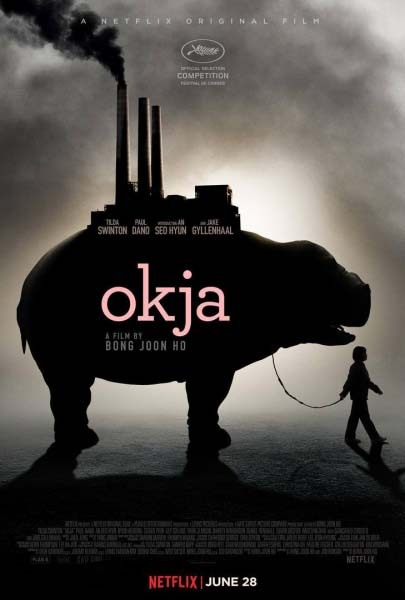 Okja was modelled after pigs and manatees. The film generated some controversy after being selected for the competition line-up of the 2017 Cannes Film Festival, due to the fact that, as Netflix productions, they wouldn't receive a theatrical release in France after the festival. Netflix did try to make a deal with French distributors and cinema chains for a limited release prior to the streaming premiere, but this was hindered by very strict French laws which prevent any film that's released in cinemas from being available on a streaming service prior to 36 months after the original theatrical release date. Although both films were retained in the competition line-up, the festival did respond to the controversy by amending its rules, specifying that all filmmakers and producers submitting their work for consideration for the competition must be committed to obtaining regular theatrical distribution in France. When the movie premiered at the Cannes Film Festival, the audience began to boo when the Netflix's title card was shown in the opening credits, they then followed up by showing the first 10 minutes of the film in the wrong ratio causing more booing. The film was played again from the beginning with even louder boos when the Netflix's title card was shown for the second time. The film stars an ensemble cast headed by South Korean child actress Ahn Seo-hyun, alongside Hollywood actors Tilda Swinton, Paul Dano, Steven Yeun, Lily Collins, and Jake Gyllenhaal. The performances given the cast were as unique and multilayered as you would expect from a Bong Joon-ho film. Bong Joon-ho's Okja is a socially-conscious genre hybrid about the cruelty and the inhumanity of corporate manipulation of nature that is consumed everyday within our society. An international action-adventure, a political satire, and an unusual and touching love story, Bong Joon-ho's latest is a subversive blast. Also, see my review for Snowpiercer. 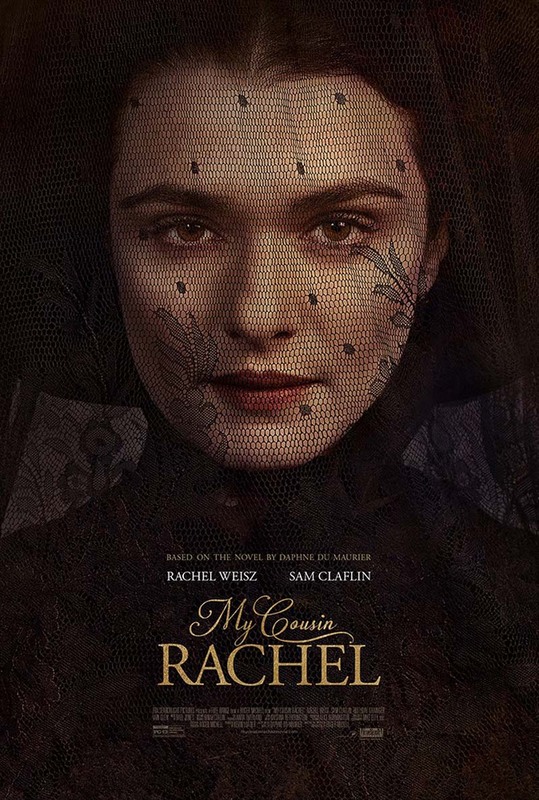 Film Review: "My Cousin Rachel" (2017). "Did she? Didn't she? Who was to blame?" This is My Cousin Rachel. This American-British romantic drama film, written and directed by Roger Michell, based upon the 1951 novel of the same name by Daphne du Maurier. The film centres on a young Englishman who plots revenge against his late cousin's mysterious, beautiful wife, believing her responsible for his death. But his feelings become complicated as he finds himself falling under the beguiling spell of her charms. The film is the latest of several recent adaptations of Daphne du Maurier's work. This is the first cinematic adaptation of My Cousin Rachel since the 1952 film of the same name. When it came to the first cinematic adaption, Twentieth Century-Fox brought the rights to the story in September 1951 when every major studio in Hollywood rejected it. Fox also secured George Cukor as director. However, du Maurier and Cukor reviewed a screenplay draft and found it unfaithful to the novel, with du Maurier declaring it "Quite desperate." Cukor also disapproved of the comedic additions, and without achieving his desired revisions to the screenplay, opted to quit. Henry Koster later took over Cukor's role. According to Burton, Cukor planned for either Greta Garbo or Vivien Leigh to star as Rachel. The part ultimately went to de Havilland, marking her first film role since The Heiress (1949), as she had afterwards taken stage roles. The film also marked Richard Burton's first time starring in a U.S. film. Though uninterested in the novel or screenplay, Burton accepted the role due to his respect for Cukor, and he traveled to New York City for production. Background shots were filmed in Cornwall, where the story is set. The film went to become a success upon its initial release. In January 2015, Fox Searchlight secured Roger Michell to direct the film and write the screenplay. In September 2015, it was announced Rachel Weisz was in talks to star in the film. She took the role, and envisioned the character as "sexually liberated". That same month, Sam Claflin joined the cast, stating he was interested because Philip was an ordinary, immature character, who was virginal until discovering Rachel. In February 2016, Holliday Grainger joined the cast, followed by Iain Glen in March. Principal photography began in April 2016, and lasted through the spring in South Devon, Oxfordshire and Surrey, England, and Arezzo, Italy. The film stars Rachel Weisz, Sam Claflin, Iain Glen and Holliday Grainger. The cast gave intense and excellent performances. As to Ms. Weisz herself, she gave a rather ambigious performance. Throughout the film, you wonder if she is who she says she is, which was a tremendous feat. Thanks to the suspense, atmosphere and the performance given by Rachel Weisz, My Cousin Rachel is simply excellent. Weisz's performance, as well as Claflin's, gave a strong impression while watching the film unfold, and long after you have left the cinema. Weisz was just simply brilliant as the title character. NZIIA Seminar: 'An Outsider’s View From the Inside on Current British Politics'. Just like, and prior to, their U.S. counterparts, the United Kingdom were hit with their own bombs in the form of the referendum of the U.K. leaving the European Union, which was issued on 23rd June 2016, and the recent general election in June. Which resulted in a hung parliament, which saw the conservative party losing the number of seats from 330 to 318. These factors raised a fundamental question: What is the future of the U.K. and the E.U.? To answer this important was last night’s speaker Sir Lockwood Smith. By the end of the seminar, the answer was as speculative and uncertain as the future of the U.K. and the E.U. Throughout, Sir Lockwood addresses the turmoil that has befallen onto the world, especially the U.K., the uncertain future of Brexit and its possible consequences, and the dramatic backfire of Theresa May, who advocated for a "strong and stable" leadership that can successfully negotiate a "hard Brexit", which was originally intended for her to consolidate her power following David Cameron’s resignation. In addition, discussing the Labour Party’s surge of popularity, thought to be left for dead under the new leadership of Jeremy Corbyn, after these cataclysmic events. During the Q&A, an interesting question was raised among a list of interesting questions, How will these recent events affect New Zealand and in particular, the Republic of Ireland? Sir Lockwood answered that New Zealand advocated that the United Kingdom remain in a "reformed" E.U., however David Cameron didn’t succeed in doing so. Even though he performed well on the economics front in preventing the UK from sliding into a deep recession, his legacy has been tarnished by the Brexit results. He continued that the Republic of Ireland on the other hand under their new leadership has been playing things very wisely since the situation in regards to the border with Northern Ireland has been troublesome to say the least in the last century. Sir Lockwood advocated a need for "smart politics" and not for "dumb politics" to rise (the latter can lead to catastrophic results – also fuelled by populism). Sir Lockwood’s outlook on NZ’s future – the most prosperous nation in the world right now since our industries are not regulated (regulation means falling behind competition) – a bit of a naïve and too optimistic outlook since the country is suffering from a brain drain. For more information regarding Sir Lockwood Smith, his initial careers included agriculture (with a Ph.D. in Animal Science, he worked at the Dairy Board), academia (as a lecturer at Massey University) and the media (as a TV presenter). He entered Parliament in 1984. He was at various times the Minister for each of Education, Agriculture, Tourism and International Trade, and Associate Minister for Finance and for Immigration. His achievements include promoting the 100% Pure tourism campaign, spearheading New Zealand’s efforts at the 1999 APEC negotiations, and conceiving and initiating the negotiations with Singapore for a new-model Free Trade Agreement that morphed into the Trans-Pacific Partnership talks. From 2008 to 2013, he was the Speaker of the House. From 2013 to 2017, he was High Commissioner in London. He has recently become a patron of the British New Zealand Business Association. Film Review: "Transformers: The Last Knight" (2017). "They have been here forever." This time it's Transformers: The Last Knight. This science fiction action film based on the toy line of the same name created by Hasbro. It is the fifth installment of the live-action Transformers film series and a sequel to 2014's Transformers: Age of Extinction. The film is once again directed by Michael Bay, with a ghastly script written by Art Marcum, Matt Holloway and Ken Nolan. The Last Knight once again destroys the core myths of the Transformers franchise, and redefines what it means to be a cinematic abomination. Once again, humans and Transformers are at war, Optimus Prime is gone. The key to saving our future lies buried in the secrets of the past, in the hidden history of Transformers on Earth. Saving our world falls upon the shoulders of a ridiculous alliance: a hopeless American inventor; a bizarre English Lord; and an unrealistically attractive Oxford Professor. After the release of Age of Extinction, in March 2015, it was reported that Paramount Pictures was in talks with Oscar winner Akiva Goldsman to pitch new ideas for the Transformers franchise's future installments. Wanting to have a cinematic universe of their own similar to Marvel's/Disney's Marvel Cinematic Universe, thus a writers' room was set up to plan the franchise's future beyond the main film series. Goldsman became the head of the future projects and would work with Bay, Steven Spielberg, and Lorenzo di Bonaventura. In July 2015, Goldsman and Jeff Pinkner were announced as the film's screenwriters. However, in November, due to Goldsman and Pinkner's other commitments, Paramount began to negotiate with Art Marcum, Matt Holloway and Ken Nolan to write the film. Despite this, Bay had decided not to direct any future Transformers films. But in January 2016, in an interview with Rolling Stone, he confirmed that he would return to direct the fifth film, and that it would be his last Transformers film. Back in December 2014, Mark Wahlberg confirmed that he would return for the sequel, and like Bay, confirmed that this will be his last in the franchise. In May 2016, it was confirmed that Josh Duhamel would return for the film. In September 2016, Stanley Tucci confirmed his return. In October 2016, Bay announced that John Turturro would return. By late 2016, the cast was rounded out with actors such as; Anthony Hopkins, Laura Haddock, Isabela Moner, Santiago Cabrera, Peter Cullen, John Goodman, Ken Watanabe, John DiMaggio, Omar Sy, Frank Welker, Tom Kenny, Steve Buscemi and Gemma Chan. With a budget of $260 million, Principal photography began in May 2016. Locations included Cuba, Arizona, Michigan, Illinois, Scotland, Wales and England. Filming wrapped in December 2016. Like the previous instalment, the film was struck by controversy. During filming in England, Blenheim Palace was decorated as a Nazi headquarters for the World War II scenes. This caused controversy among British war veterans, who protested that the palace was the former residence of war hero Winston Churchill, and didn't deserve such treatment; Bay explained that this was part of the film, and Churchill's grandson Sir Nicholas Soames lambasted the British press for sensationalizing a mere film scene. The performances given by the stellar cast once again have contributed nothing to Bay's 2 hours and 30 minute film of him masturbating and ejaculating to explosions, car chases and adolescent-looking female stock characters like a fourteen year old boy discovering how to. With Transformers: The Last Knight, nothing is in disguise. Fans of the same old Hollywood/Michael Bay claptrap will find mentally-impaired satisfaction. The same can not be said for others who had enough of Bay's abhorrent antics for the past decade. 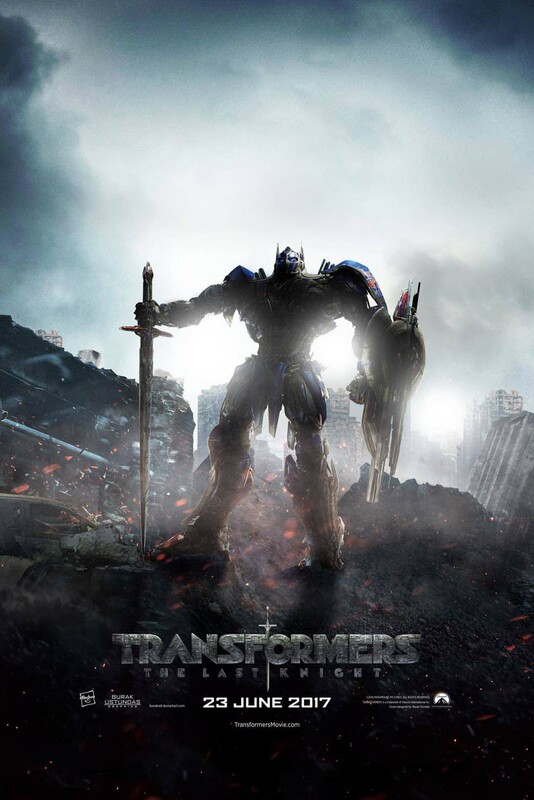 Also, see my review for Transformers: Age of Extinction. Film Review: "Despicable Me 3" (2017). "Oh Brother." It's Despicable Me 3. This 3D computer-animated comedy film directed by Pierre Coffin & Kyle Balda, co-directed by Eric Guillon, written by Cinco Paul and Ken Daurio and produced by Illumination Entertainment. It is the third installment in the Despicable Me film series, and the sequel to Despicable Me 2 (2013). 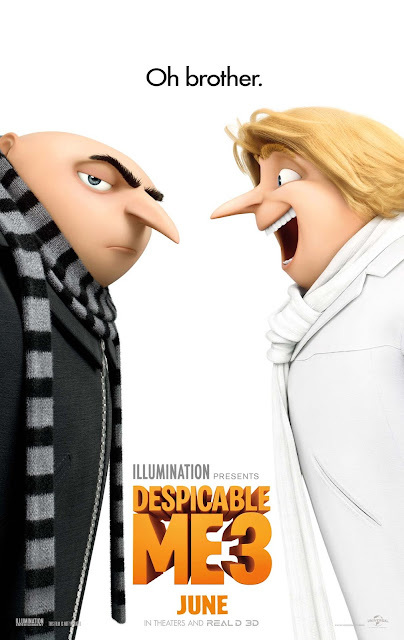 Gru meets his long-lost charming, cheerful, and more successful twin brother Dru who wants to team up with him for one last criminal heist. Steve Burke, the NBCUniversal CEO, confirmed in September 2013 that a third instalment in the Despicable Me series was in development. Cinco Paul and Ken Daurio, the writers of the first two films, announced that they would return to write the screenplay for the film. By April 2016, the original cast were confirmed to return, alongside with the additional casting of Trey Parker, co-creator of South Park, as the main antagonist for the film, Balthazar Bratt. The antagonist's name is a tribute to actor Benjamin Bratt, who had previously voiced the villain, El Macho, from the previous film. Steve Carell said that Despicable Me 3 may be his last film as the voice of Gru. However, Carell stated that if he was asked to do a cameo in any future Minion sequels, he happily would. Agnes's voice actress Elsie Fisher from the first and second movies was replaced by Nev Scharrel due to Fisher getting too old for the role. It stars the voice talents of Steve Carell, Kristen Wiig, Miranda Cosgrove, Steve Coogan, Julie Andrews, Jenny Slate and Trey Parker. The previous cast gave terrific performances that has the same qualities as their previous performance. As for Mr. Parker, he gave an incredible performance of a character who has surpassed the previous antagonists in terms of comic villainy and memorability. Parker was an absolute show-stealer. Despicable Me 3, unlike its previous instalment, boasts the requisite dramatic richness that adds to the animated fun for the whole family. The film offers a fun-filled, action-packed conclusion to Illumination's endearing animated series. With a plethora of less-than-ambitious animated options, or a lack there of, out there, the film is a good addition to the summer slate. Being a good addition justifies the money (and time) required for a viewing. At times, it's a dramatically rich movie, filled with likable characters, as well as digestible gags, that should keep kids smiling and giggling. In spite of its abundant action – and for all the mashups, this is as much an action-adventure animated movie as it is a funny animated movie – is a pretty relaxing experience, even for the adult viewer. The film's story is complete enough to reward steady viewers and just simple enough for parent escorts to enjoy without much prior knowledge. While the storyline, in which Carell's villain-turned Anti-Villain League agent is reunited with his long lost twin brother, doesn’t quite fulfill its promises, visually speaking, dramatically speaking it’s quite impressive — one of those very rare animated features that completely justifies its viewing. In the end, while generally entertaining, this third instalment of the Illumination Entertainment franchise is a comedown from the first entry. Also, see my review for Despicable Me 2 and Minions. 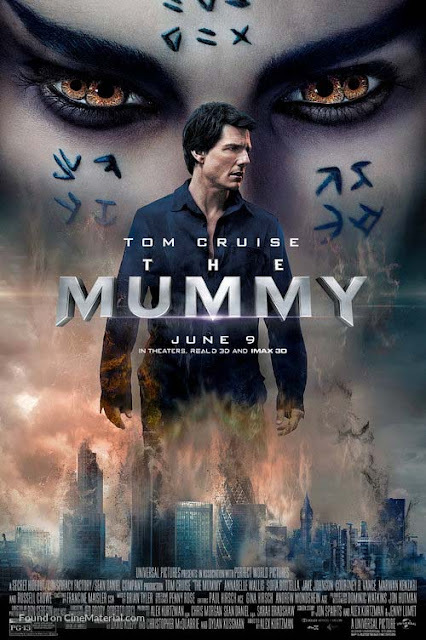 Film Review: "The Mummy" (2017). "Welcome to a New World of Gods and Monsters." Welcome to the world of The Mummy. This action-adventure-horro film directed by Alex Kurtzman and written by David Koepp, Christopher McQuarrie and Dylan Kussman, with a story by Kurtzman, Jon Spaihts and Jenny Lumet. It is a reboot of The Mummy franchise and the first installment in Universal's planned Dark Universe franchise. An ancient Egyptian princess is awakened from her crypt beneath the desert, bringing with her malevolence grown over millennia, and terrors that defy human comprehension. Universal Pictures first announced plans for a modern reboot of The Mummy franchise back in 2012, with multiple directors at the helm, from Len Wiseman, in 2013, to Andrés Muschietti, in 2014. When Universal was planning their Dark Universe franchise they originally envisioned Dracula Untold (2014) as the first installment with this film being the second. That film ended with a obvious set up for future installments. There was early talk about Dracula appearing in this film. However, as this film progressed it was cited as the first in the Dark Universe leaving the earlier movie to exist on its own. While Dracula director Gary Shore said he hoped the possibility that his film would join the universe was left open. Director Alex Kurtzman said it would not be canon. Tom Cruise began talks about playing the lead in November 2015, with Sofia Boutella beginning talks that December. Kurtzman cast Boutella after seeing and being impressed by her largely mute performance in Kingsman: The Secret Service (2015). Other casting news was announced between March and May, with Annabelle Wallis, Jake Johnson, Courtney B. Vance, and Russell Crowe joining. Principal photography on the film began in April 2016, and wrapped in August. Filming locations London, Oxford, and Surrey, England, as well as Namibia, Africa. Filming for the film's pivotal scene involving a plane crash, the production made use of The Vomit Comet, and parabolic flight, to simulate the illusion of weightlessness. Initially Kurtzman planned to shoot the scene entirely using wires and a rotating set, however Cruise's insistence changed his mind. The set piece took a total of sixty-four takes and was shot for two days, leaving many of the crew becoming sick to their stomachs, except for Cruise and Wallis, who were really proud of the stunt. The film stars Cruise, Boutella, Wallis, Johnson, Vance, and Crowe. The entire cast gave generic performances that is expected in a film of this kind, unfortunately, with Cruise, Boutella and Crowe providing the worst performances. Cruise gave the most generic Tom Cruise of his entire career, with lacklustre charm and stunts. Boutella failed to capture the terrifying and sympathetic nature that made Boris Karloff's portrayal immortal. Crowe gave a performance that was both incomprehensible and confusing as a character of classic horror literature. It's difficult to make a persuasive argument for The Mummy as any kind of meaningful cinematic blockbuster achievement. There is hardly a thing I can say in its favour. I cannot argue for the script, the direction, the acting or even the mummy. With factors such as a rising China, Brexit and the Trump presidency, New Zealand’s future is come into question with all these signals of change. New Zealand’s independent foreign policy has served the country well, but may now require some modification. Which was the focus of last night’s seminar presented by Professor Alan Tidwell (director of the Centre for Australian, New Zealand and Pacific Studies at the Edmund A. Walsh School of Foreign Service at Georgetown University). Using the three Bs (Bandwagoning, Balancing, and Being Neutral), Professor Tidwell "pitched" his ideas and views on New Zealand’s challenge is to create a foreign policy response while maintaining foreign policy independence with the changing and challenging environment they are in. In his words, New Zealand is somewhere between Bandwagoning and Balancing, as they ally themselves with the United States and China (in a somewhat minor capacity), as well as being able to maintain its own interests such as its relations with its indigenous populace and the rest of the Pacific. Professor Tidwell emphasized that an important element of New Zealand’s stance and independence is maintaining access and relevance to great powers. Strengthening New Zealand’s peace-making capacity may provide the best way forward in adjusting to the international changes while keeping true to New Zealand’s foreign policy goals. He suggested that New Zealand could achieve a higher and more important position by continuing to be a successful player in indigenous policies and maintain its relations. Despite problems in trying to maintain and being a successful player in that game. In addition, New Zealand needs to step up its game in trying to gain a prominent stance by paying more attention to more international issues and gaining stronger relations with China and U.S., whilst reducing its efforts in the Pacific. Finally, New Zealand needs to play more of the intermediary role like its Scandinavian role models such, Switzerland and Norway (both of whom played the role very well). To those who are curious to gain better insight into last night’s speaker, prior to becoming the director of the Centre for Australian, New Zealand and Pacific Studies at the Edmund A. Walsh School of Foreign Service at Georgetown University, Professor Tidwell was a program officer with the United States Institute of Peace, where he specialized in conflict resolution and capacity building in Southeast Asia. His work focused particularly on the peace processes in Mindanao and Aceh. Tidwell collaborated with scholars from these conflict-affected regions to develop conflict resolution curriculum programs. In 1992 Tidwell, a Washington D.C. native, moved to Sydney, Australia where he was a lecturer in the Centre for Conflict Resolution at Macquarie University. Later, he moved to Sydney University where he became the research director of the Australian Centre for American Studies. At Sydney University Tidwell focused on enhancing the Australian American relationship through research and public education. He returned to Macquarie University as a senior lecturer at the Graduate School of Management, specializing in conflict resolution and negotiation. He holds a PhD. in international relations from the University of Kent, a Masters in professional ethics from the University of New South Wales, and a Masters degree in conflict management from George Mason University. Film Review: "Wonder Woman" (2017). "Power. Grace. Wisdom. Wonder." This is Wonder Woman. This superhero film based on the DC Comics character of the same name. It is the fourth installment in the DC Extended Universe, as well as being the first live action theatrical film based on the character. The film is directed by Patty Jenkins and written by Allan Heinberg. When an American pilot crashes on their shores and tells of a massive conflict raging in the outside world, Diana leaves her home, convinced she can stop the threat. Fighting alongside men in a war to end all wars, Diana will discover her full powers and her true destiny. Development for the film was on-going since 1996, with several writers and directors attached such as Ivan Reitman, Todd Alcott, Laeta Kalogridis, and Joss Whedon. In 2014, several directors were considered to direct the film before Michelle MacLaren was given the job. However, in 2015, MacLaren dropped out of the project due to creative differences. In 2015, Patty Jenkins replaced MacLaren. Many actresses were considered to play the role of Wonder Woman throughout the years before Gal Gadot landed the coveted role. Principal photography began in November 2015, before filming wrapped in May 2016. Filming took place throughout the United Kingdom, France, and Italy. Additional filming also took place in November 2016 while Gadot was five months pregnant. A green cloth was placed over her stomach to edit out her pregnancy during post-production. The film stars Gal Gadot as the titular character with Chris Pine, Robin Wright, Danny Huston, David Thewlis, Connie Nielsen and Elena Anaya. The cast all gave spectacular and powerful performances, especially that of Gadot. Gadot has, without a shred of doubt, single-handedly laid to rest my concerns whether or not she can carry her own franchise. Gadot has just the right touch of strength and femininity. She really is Wonder Woman. I can not wait for her future films. She and Pine had great on-screen chemistry where their personalities and ideologies suited for each other's characters, and is what made their dynamics interesting. However, despite the amazing performances, there were characters that were not completely without flaws. This regards the villains played by Huston, Anaya and Thewlis, who all suffered the same razor-thin characterisation found in Marvel films, despite the three actors giving their best. 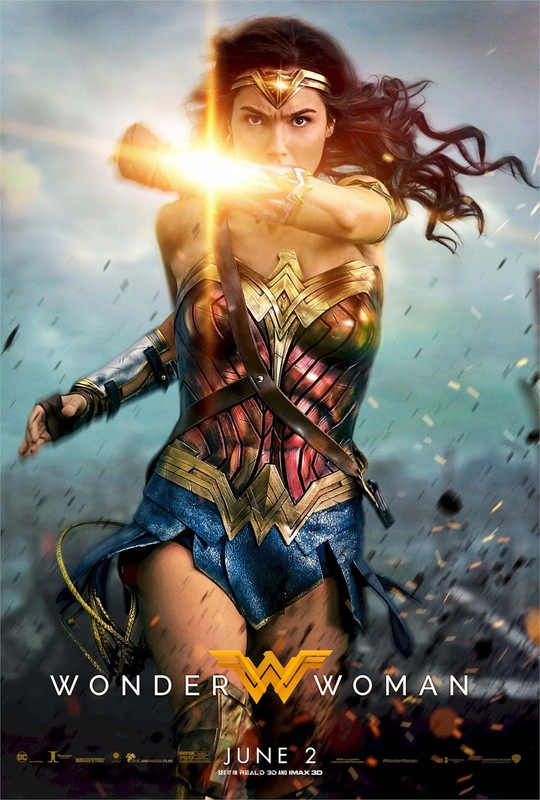 Wonder Woman brilliantly blends humour and gravitas, taking advantage of the perfectly cast Gadot to craft a loving cinematic tribute to an American pop culture feminist icon. Fantastical and gritty, but also exciting and fun, this is a film that understands the essence of one of the definitive superheroes. Director Jenkins and Screenwriter Heinberg's work in creating understanding into who Wonder Woman is and what motivates her must be applauded. They have accomplished something that the original TV series had somewhat lacked. However, there's no doubt that, at times, it's a flawed movie, but it is still nonetheless one of the most wonderfully entertaining movies made in recent years. It's exactly what comic book fans hoped it would be. Also, see my review for Suicide Squad.